The Jacuzzi® J-465™ hot tub is a natural fit for anyone looking for a sleek and stylish addition to their backyard or cottage. 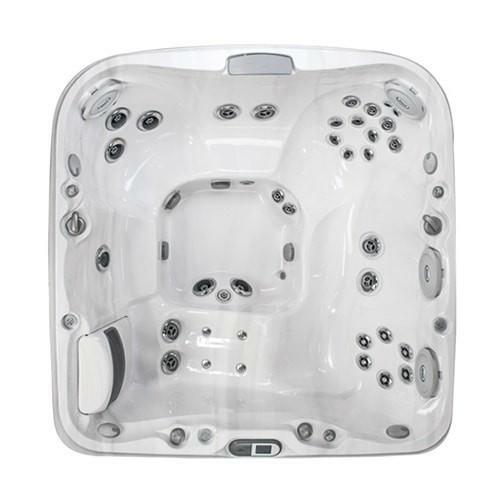 The Jacuzzi® J-465™ model provides enough space and a full massage for four to five adults. Loaded with ambient LED lighting and 37 PowerPro® Jets, the illuminated experience this Jacuzzi® hot tub has to offer is unparalleled in its class. The interior lighting system and the exterior accent lights aren’t the only beautiful feature in this hot tub – the waterfall is built in an elevated position to give the J-465™ an elegantly curved profile. It also comes in a variety of cabinetry and acrylic shell finishes to complement your backyard arrangements. The soft lighting will envelop you while the therapeutic waterfall pours over your shoulders. The easy-to-use control system means less complication and more relaxation. Jacuzzi® PowerPro® PX Jets and FX2 Spinners effervescently release stress. This hot tub boasts the ProAir™ Lounge Seat and Premium PowerPro® Jets, including six robust RX Jets and the LED-lit bubbling IX Jet. ProAir™ Lounge Seating supplies full-body tension relief whenever its needed. Elevated waterfall enhances the over-your-shoulder hydrotherapy experience. Rigorously tested Jacuzzi® filtration system provides quiet, easy and energy efficient operation. Optional exterior lighting features add to the sophisticated styling of the J-465™. The quick-reference status indicator light will let you know that your hot tub is ready to use, while the backlit dual waterfalls, pillows and cup holders add to the ambiance in this family-size hot tub. Lastly, the full body massage lounge seat included in the five-seating positions makes this one of the most versatile hot tubs we have to offer. This seat targets large muscles of the back with a Swedish-like hydromassage. It also boasts spiral stream jets that relieve tension in the calves and feet. Packed with stimulating spiral action jets, this seat covers your neck and back with a versatile, deep tissue massage. Also stimulates muscles and relieves tension in the calves. This deeply contoured seat is perfect for those seeking a deep tissue massage to loosen muscle knots in the lower back and relieve tension in the neck.